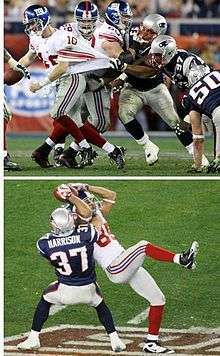 The Helmet Catch was an American football play involving New York Giants quarterback Eli Manning and wide receiver David Tyree in the final two minutes of Super Bowl XLII on February 3, 2008. It featured Manning escaping from the grasp of three New England Patriots defensive players and throwing a forward pass, followed by Tyree making a leaping catch by pressing the ball against his helmet. The play, a 32-yard gain during a drive on which the Giants would score their game-winning touchdown, was instrumental in the Giants' 17–14 upset victory over the Patriots, who were on the verge of becoming the first National Football League (NFL) team to finish a season undefeated and untied since the 1972 Miami Dolphins, and the first since the NFL adopted a 16-game schedule in 1978. NFL Films' Steve Sabol called it "the greatest play the Super Bowl has ever produced". The play was also named by NFL Films "The Play of the Decade (2000s)". Tyree had been used primarily on special teams and had only 4 receptions for 69 yards and no touchdowns during the 2007 regular season. Although Tyree was seldom used as a receiver during the regular season, he caught the Giants' first touchdown of the Super Bowl early in the fourth quarter, (which was Tyree's first touchdown of the season) giving his team a 10–7 lead at the time. The Patriots, undefeated on the season and heavily favored to win the game, scored a touchdown on a pass from Tom Brady to Randy Moss to take a 14–10 lead with 2:42 remaining in the game. The Giants then faced a 3rd down with 5 yards needed for a 1st down from their own 44-yard line with 1:15 remaining. On the previous play, Patriots' cornerback Asante Samuel dropped what could have been a game-sealing interception. Manning called the play "76 Union Y Sail" from the Giants' playbook in hopes of connecting with a receiver downfield. On third and 5 from the Giants' 44 yard line, Manning took the snap in the shotgun formation and immediately faced pressure from the Patriots defensive ends Richard Seymour, Jarvis Green, and linebacker Adalius Thomas. Green grabbed Manning by the shoulder while Seymour grabbed him by the back of his jersey and attempted to pull him down for a sack. Manning, however, was able to stay on his feet and duck under the arms of the Patriot defenders before scrambling backwards into space at around the 34 yard line. Linebackers Mike Vrabel and Junior Seau attempted to sack Manning but he got off the throw to David Tyree. After Eli Manning released the football, he was immediately hit by Mike Vrabel. He threw the ball down field to Tyree at the 24 yard line of the Patriots. Fox announcer Troy Aikman said after the play, "I don't know how he got out of there." Had Manning been sacked, the Giants would have faced a fourth down with around 8 yards to go for a first, and would have needed to convert for the second time on the drive to keep their chances to win alive (halfback Brandon Jacobs converted on a 4th and 1 three plays earlier in the drive). ↑ Sabol, Steve (February 10, 2008). "Sabol's Shot – Tyree catch". NFL Films. Retrieved February 5, 2012. 1 2 "Play of the decade". NFL Films. February 5, 2010. Retrieved February 5, 2012. ↑ "David Tyree Statistics". Sports Reference. Retrieved February 5, 2012. ↑ "Readers pick 'Catch 42' for Super Bowl's biggest play". New York Daily News. February 12, 2008. Retrieved February 5, 2012. ↑ Spencer, Sheldon (January 25, 2011). "David Tyree recalls 'Catch-42'". ESPN.com. Retrieved February 5, 2012. ↑ "The Super Bowl XLII mailbag". ESPN.com. February 8, 2008. Retrieved February 5, 2012. 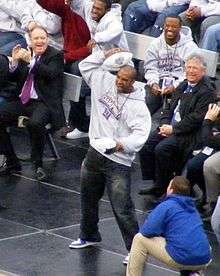 ↑ "Everett, Tyree, NY Giants win ESPY Awards". Associated Press. July 17, 2008. Retrieved February 5, 2012. ↑ Borden, Sam (January 15, 2012). "Giants 37, Packers 20: Giants Knock Out the Champs". The New York Times. Retrieved February 5, 2012. ↑ Hasenmeyer, Adrian (February 6, 2011). "Top 10 Super Bowl Plays of All-time". Fox Sports. Retrieved February 5, 2012. ↑ Svekis, Steve. "Greatest Super Bowl Moments". NBC Sports. Retrieved February 5, 2012. ↑ "Top 10 Super Bowl plays". National Football League. February 3, 2011. Retrieved February 5, 2012. ↑ Sabol, Steve (November 18, 2008). "Tyree's catch goes down as best play in Super Bowl history". National Football League. Retrieved February 5, 2012.